During the rainy season, your yard can turn into a series of puddles that are unsightly, unsafe, and downright annoying. Excess water in your yard can eventually lead to cracks in your foundation, raised spots in your concrete, damage to your shrubbery, and more. If you can successfully direct water away from your yard, you may be able to avoid all of these problems. Here are some tips for how to prevent your yard from flooding. If you have old, worn out gutters, it might be time to replace them. Invest in seamless gutters and downspouts that will direct your water exactly where you want it to go. Even if you have good gutters right now, you might want to review their drainage path to make sure it fits your yard. 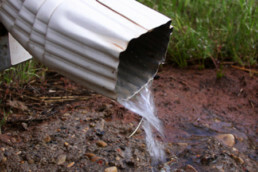 It is possible that your gutters are draining water right into a low spot in the yard. Alter the drainage to another area and you could reduce your flooding. The water coming out of your gutters will need a place to go. Why not build a path out of pebbles that will direct the water away from your house? If you have plants in your yard that do not get much water, you might want to direct the path towards them. You may also want to direct the water into a pond nearby, if you have one. The goal is to control where the water goes so it does not end up as a puddle in your yard. If your yard has a lot of hills and valleys, you might want to make sure the valleys have drains in them. This can be costly to do, so it may not be something you are capable of right away. In that case, it might be best to alter the land to not have valleys in it. Cover the low spots with dirt and sod, and monitor where the water goes after that. Hopefully you will be able to create a yard free of puddles. It's not always easy to prevent your yard from flooding, but doing so will help your home foundation tremendously. Keep an eye on the water flowing in and out of your yard, and make ig go exactly where you need it to. 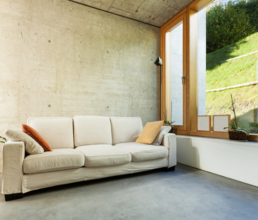 Is Concrete Flooring Right for Your Home? Concrete flooring is becoming a popular option for new and remodeled homes because it is more affordable than hardwood, carpet, and even some laminate options. It can be stained and formed to look like exquisite tile flooring, but at the end of the day, it's just a jazzed-up version of what you have in your driveway. Before you choose to add this to your home, you need to understand the pros and cons of concrete flooring. Consider the information below. Concrete flooring is incredibly durable, which means it should last for quite some time. With that in mind, a large concrete slab could crack and chip over time. Much like the concrete on the exterior of your home, the concrete on the interior will be subject to movements in the ground or changes in the weather. It may eventually become unlevel due to its surroundings. At that time, you will have to get your flooring leveled and you'll probably have to redo the surface of the concrete. In the harsh Detroit winters, your concrete flooring is going to turn into an ice skating rink of freezing temperatures. The heat in your home will help warm it up, but it will still be a little shocking first thing in the morning. Concrete looks great and can be strategically covered with area rugs, but it will never be as warm as carpeting. The statement above may seem like it is contradicting itself, but that is not the case. Concrete flooring is versatile in the way it can be stained and formed, but it is limited in its textures and high-end appeal. Even though you can make concrete look like expensive tile, people will know it's just concrete whenever they walk around on it. There are more and more designs for stained concrete popping up every year, but the options still aren't as expansive as you may want them to be. You should still be able to find something you love in the end though. If you want something that is cheap and easy to clean, concrete flooring is a great choice for you. If you would prefer something that is more comfortable and a little more luxurious, go for hardwood or carpeting. As long as you spend your money on items you can be happy with, there should be no issues with your flooring.